Great choice of small and large hotels in convenient city, town and seaside locations all over France for all budgets and suitable for families and couples planning romantic weekend breaks and holidays. France is divided into administrative regions and each has its own capital. The hotel A La Villa Madame is located in Paris's arty 6th arrondissement, in the Saint-Germain-des-Prés district. The modern air-conditioned rooms have a refined style and offer free Wi-Fi access. Acadia Opera is located in the 9th district of Paris, 800 metres from the famous department stores and a 10-minute walk to Opera Garnier. It offers free Wi-Fi. The bright guest rooms are equipped with air conditioning, satellite TV and a work desk. The hotel is happy to welcome you in the heart of the Montparnasse district, one of the many lively and trendy districts in Paris. It is well-known as one of the former preferred districts among painters and writers. Located in the 15th district in central Paris, this hotel is just 140 metres from Convention Metro Station. It has a 24-hour reception and offers guest rooms with a TV. Each soundproofed guest room is equipped with a telephone and a desk. Situated on a lively street right next to Place de la Bastille in central Paris, this budget hotel offers a daily continental breakfast. The simple guest rooms at Hotel Central Bastille come with a private bathroom and a flat-screen TV. 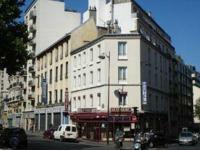 The Citadines Apart'hotel Bastille Marais is ideally situated halfway between the Bastille area and the Marais. You are 10 minutes away from the heart of the Marais and the Place des Vosges. The 3-star Best Western Aurore is located 250 metres from Gare de Lyon Train and Metro Station in east Paris. It offers air-conditioned guest rooms with free Wi-Fi internet access. This hotel is located in Paris's prestigious Left Bank district, just an 8-minute walk from the Louvre Museum. It offers air-conditioned guest rooms with a period-style décor and free Wi-Fi. Located close to the Bastille and the Marais areas, the Aux 3 Portes hotel will welcome you in a warm atmosphere. You will enjoy our central location in Paris.